This week's ReSource Non-profit Help special ... order one metal file cabinet and get the second one of equal value half off. launch a new program. 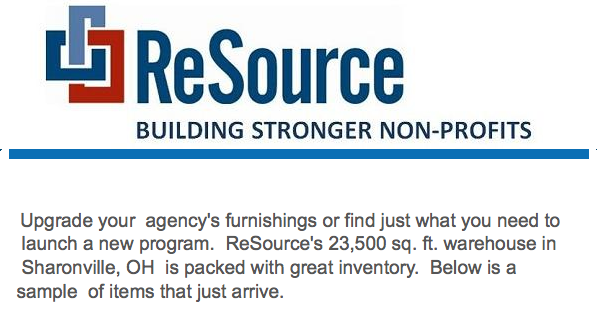 ReSource's 23,500 sq. ft. warehouse in Sharonville, OH is packed with great inventory. Below is a sample of items that just arrive. This week's special ... order one metal file cabinet and get the second one of equal value half off. Call us at 513.554.4944 if you have questions or visit the agency at 3610 Park 42 Drive in Sharonville. Hours: Monday through Friday 8:30 a.m. until 4:15 p.m.
second file cabinet of equal value half off. clothing rack and 5 shelves, locking. Dimensions: 5 1/4"x 7 1/4"